I have had the OS out the past few clear nights and have enjoyed the clusters along the winter MW. Lots an lots of stars.,very nice views.,I have been using the ES 68*/20mm eyepiece getting 32x w/2*tfov. Wow. I wondered back in post #3434 whether Nightrain's Cheshire might not go all the way into the focuser. I even posted a photo of a Cheshire much like yours--assuming that it could be inserted all the way to the upper shoulder. If I understand you correctly, only the very bottom part of your Cheshire is small enough to fit into the focuser. Nightrain's Cheshire must be the same. I made a false assumption that Cheshires that look like yours can be inserted all the way to the shoulder, as mine can. I apologize to anyone for whom that caused confusion. My thanks to you and to your informant for straightening this out. Edited by Lazaroff, 11 March 2019 - 10:26 PM. These recent conversations about collimation have been difficult to navigate, and I'm afraid I muddied the waters a bit with my false assumption about certain Cheshire collimators (post #3478). In the hope of bringing a little clarity, and to atone for my mistake, I'll summarize what I've learned from all this. 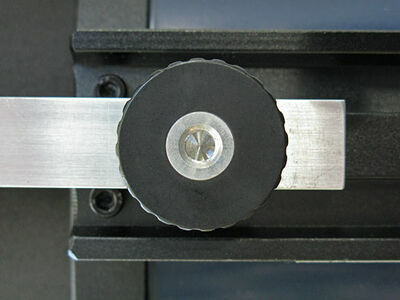 I'm going to submit two posts about the related issues of focuser wobble and collimation tools. I'll try to be brief (but I'll probably fail). Edited by Lazaroff, 12 March 2019 - 01:29 PM. Concerning focuser wobble in the OneSky, I suggest a couple of experiments. First, put the moveable part of the focuser--the drawtube--where it usually is when you're observing. If your OneSky is like mine, that's maybe a couple of turns out from the bottom. Push the drawtube from side to side to feel and see how much it wobbles. Now unscrew the focuser until it's most of the way out. Wiggle it again. It wobbles more, right? Repeat the experiment, but this time put the "collimation eyepiece" in the focuser. Start again with the drawtube in its normal observing position. Look through the eyepiece, wiggle the drawtube, and see how much the pattern of reflections shifts. Very little. Enough to matter? I don't think so. Now, as before, unscrew the drawtube most of the way out. Wiggle it again while looking through the collimation eyepiece. The pattern of reflections shifts more. But so what? The drawtube isn't in that position when you're observing. These experiments suggest to me that ordinarily the OneSky's focuser wobble should have no discernible effect on the quality of the image in the eyepiece--and in fact that's what I see. At 130X, which is about what some people consider the practical limit for the OneSky, I get exquisite views of Saturn. I used the word "ordinarily" in the previous paragraph because there are certain situations in which the wobble might conceivably matter. I haven't experienced these difficulties myself--they're entirely theoretical--but they may be worth considering, so here goes. Most eyepieces I own are in focus when the drawtube is in about the same place. (They're roughly "parfocal.") However, a few of my eyepieces of older design come into focus at varying drawtube positions. None of my newer eyepieces are like this, but I have very little experience with the enormous variety on the market today. There may be some that need enough out-focusing to cause trouble with the OneSky. I don't know. Barlow lenses often require shifting the position of the drawtube to achieve focus. If the shift is inward you can run out of movement before you get to the focus point--a familiar situation for some OneSky users. If the shift is outward it might cause trouble by moving the drawtube into the worse-wobble zone. If you're using that barlow to get high magnification (often the case), the image might conceivably be degraded by altering collimation. I haven't experienced this myself, but it seems like another reason to use a barlow that shifts the focus as little as possible (like the one I recommended in post #3456). 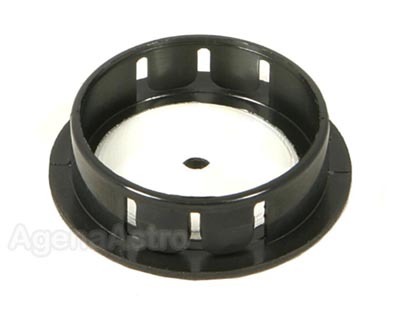 Bottom line: I admire the creative ways people are modifying their scopes to reduce focuser wobble, but for ordinary visual use I don't think we need to torture our focusers with grease, clamps, or teflon in order to preserve collimation. Edited by Lazaroff, 12 March 2019 - 01:35 PM. Concerning collimation tools, several types have been mentioned. 1. 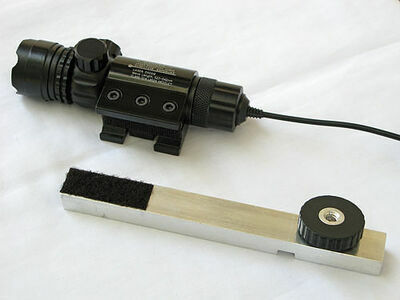 The "collimation eyepiece"--actually a Cheshire collimator--that comes with the OneSky. It works well, it's terrific that Astronomers Without Borders includes it, and it may well be all you need. Works surprisingly well--in fact, some people might prefer this simple collimator to the fancier one delivered with the scope. 3. 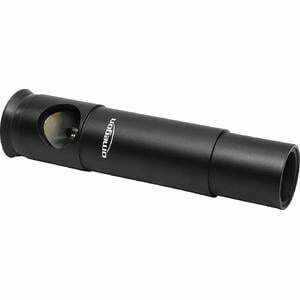 Combination Cheshire/sighting tube with crosshairs. These metal gadgets have received a lot of attention in recent posts. Their chief advantage is that the crosshairs can help in centering the reflections while you're collimating. There seem to be two general sorts common on the market, short and long. 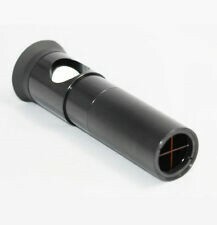 We can draw a valuable lesson from the frustrating experiences of our fellow OneSkyers: for the sake of good collimation and our own sanity, we should stay as far away as possible from any long-variety Cheshire/sighting tube combo that can't be inserted all the way into the drawtube. Edited by Lazaroff, 12 March 2019 - 01:37 PM. Meet the latest addition to our telescope family! My OneSky arrived yesterday and I had it out under the stars as soon as it got dark. I found the built quality and optics to be excellent and the telescope is an absolute joy to use. It came almost fully assembled and took just a few minutes to complete. The collimation was pretty close out of the box and I only had to make a few minor adjustments to get it spot-on. I haven’t tried the eyepieces that it came with opting instead to use my trusty 20mm Meade RG wide field eyepiece for first-light (33x , 2 degree FOV). The moon looked fantastic showing a generous amount of detail complete with Earthshine. The Pleiades were beautiful and fit nicely within the field of view. I then swung over to Orion sweeping from Orion’s Belt down along the Sword to the Great Nebula. The Nebula showed a nice expanse and level of detail. All four members of the Trapezium were nicely split as were the 6 members of Sigma Orionis. I then swept over to Sirius and star-hopped southwards to M41 and then up the eastern side of Canis Major back up to Sirius. I then star-hopped eastwards over to M47 and 46, and continued northeast to M48. I ended my brief first light by swinging over to Mizar and Alcor, and Mizar was easily split. I usually star-hop using a 50mm finder, but the wide field of view of the OneSky with this particular eyepiece was sufficient to make star-hopping easy and comfortable. The motion of the OneSky was smooth and firm and it was very comfortable to move with my hands placed on the front ring and rear mirror cell. 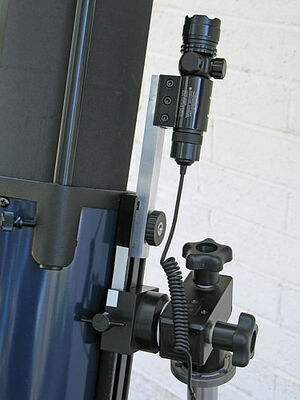 The OneSky fit very nicely on top of my standard Meade field tripod with the Peterson accessory tray as shown here. This work well while standing, but I may build a shorter tripod or table to make the telescope a little more comfortable to use while seated. One small note on the focuser; the OneSky uses a simple threaded helical focuser that can get a bit wobbly as it is screwed out. Some apply a layer of Teflon tape or a thick grease to help take of the slack in the threads. I was planning on using a thin layer of grease on mine; however I found a simple alternative that worked well with this eyepiece. Briefly, I screwed the focuser almost all the way in where the motion is tight and firm and then set the rough focus by moving the eyepiece, locking it in place with the set screws, and then set the fine focus by turning the helical focuser just a tad. 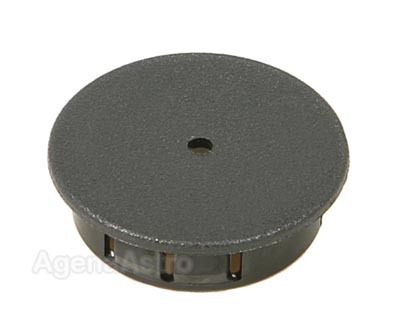 This made for a very solid focuser that was easy to adjust. I am planning on making a few simple mods including blacking the edge of the secondary and making a simple shroud to help control dew and frost, but I am delighted with the scope just as it is. This is going to make a fantastic star-hopping companion to my imaging gear. I had a chance this evening to test the AWB OneSky with the eyepieces that it came with and I was very pleased with them. The apparent FOV of the 25mm is a tad smaller than my 20mm RG wide-field, but the actual FOV is about the same. I had no problems repeating the first-light star-hop from Sirius, to M47/46, and onwards to M48. M44 fit nicely within the FOV of the 25mm. I tested the 10mm on Mizar and it gave a clean split. The soft contrast between this pair is beautiful. I then swung over to the moon and it gave a fine image. These certainly aren’t premium eyepieces, but not bad at all for the freebies that came with the scope. This is going to make a fine star-hopper. Edited by jgraham, 14 March 2019 - 10:07 PM. I know the The Astronomical League is using the Orion 4.5 " for their Library Scopes, in this just past "give away to each of their sections. As a past Pres. of Tallahassee Astronomical Soc., It was a plan of mine to get a scope of some kind into our local Libraries. I finally choose the the OneSky. I can't say enough good things about this scope, delivered for $199, and Astronomer Without Borders , still makes a little profit to continue their good work. The Soc. bought the first scope and the library boosters bought another dozen. They tell me they are in such demand that there is a waiting period to get one. They have put together a bag of observing materials to accompany the loan of the scope. All around "good show", I think. Have you all tried an inexpensive wood bar stool from the Box Stores for a support ?? I have done it for an Orion 4.5 that I gave as a gift. Should work for the OneSky. I just use a longer center azimuth bolt through a hole in the seat, and notched out the edge for the feet. I found a fitting that attached to the bottom of the feet, that used a screw in spike, that you can remove while transporting. With the spikes on and driven in the ground it makes a stable platform. Of course on hard surface no spikes and still solid. 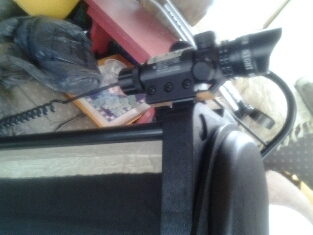 No it doesn't fold up, but its cost is much less than a good tripod for a beginner. Anyway worked for me. Edited by joecomet, 15 March 2019 - 12:33 PM. @joecomet, thanks for the good comments on the OneSky. I'm glad to hear it's being used for the library program there as well. In fact, we get more than a little profit from each of these -- Celestron provides them to us for $105, for which they do all the work, including fronting the money for shipments, right up to shipping -- so we get $95 from each OneSky sale with very little work on our part. So Celestron is responsible for making all this possible and for keeping us afloat! I made my legs attached to the base.,I think this is good because it ends up being one solid unit. If I were to buy a stool to place the scope on I would do like Joe and run a longer bolt up the middle and have a nut on top of the stool under the scope base.This will hold the scope tight to the stool and still allow the center bolt to act as the az axis. Just ordered my Onesky this evening! 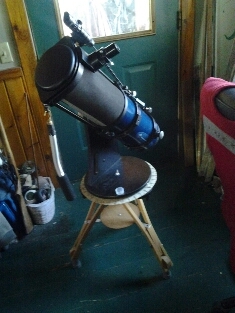 This is going to be my first telescope. My Dad has an old Bushnell when I was a kid and my father in law has a Powerseeker 127. Needless to say, I’m excited! We’re supposed to have a clear week so I’m going to spend some time outside to get my bearings a little better. Be sure to get out in the mornings! Jupiter and Saturn are out and, if planets are your thing, they are worth looking at! With the stock 10mm eyepiece you should be able to see Saturn's rings as well as Jupiter's moons and some cloud bands on Jupiter as well. Enjoy the OneSky! It's a ton of fun! Thank you for the recommendations! I’ve never seen any of those, they sound like good targets for sure! I suspect seeing Saturns rings will result in a wet EP. Look forward to showing my son as well. Edited by Nathan.M, 19 March 2019 - 07:02 PM. 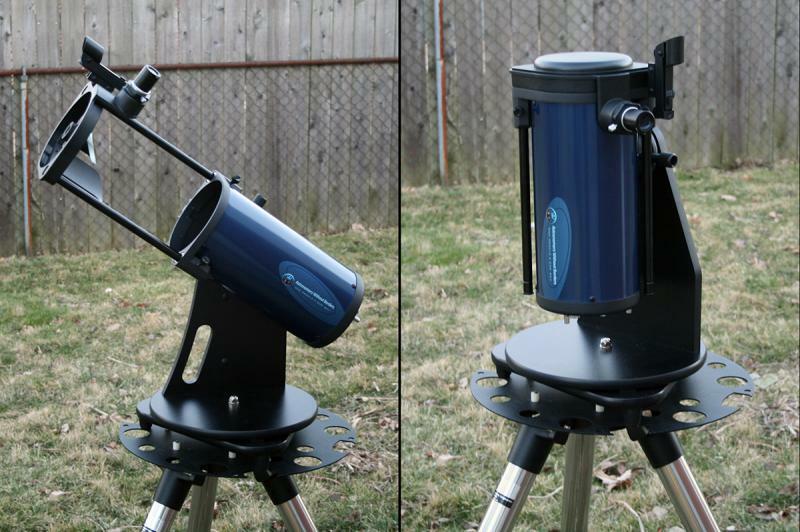 Very excited to report, I received my "OneSky 130 Newtonian from Astronomers without borders" today. Looking forward to providing updates. 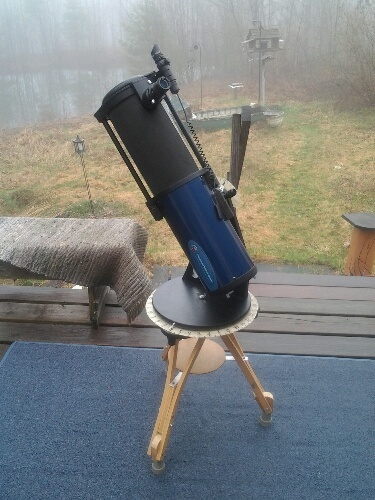 My first purchase of a telescope in many many years. My Tasco t11 has served me well. 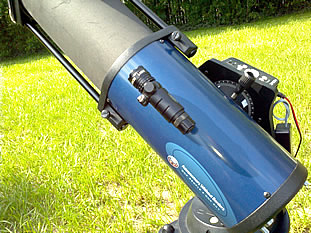 First and foremost, LOVING my "OneSky 130 Newtonian from Astronomers without borders". It has opened areas to me that I had not focused on before and reintroduced me to old friends. The Horsehead Nebula, Maia Nebula, Mars all spectacular. Even the moon, with a simple 2xBarlow & Super 10, gave me lots of joy this evening. The ISS passed over at 8:40 pm this evening and the movement and flexibility of this scope allowed me to track and enjoy even if I didn't focus very well lol. It was still a joy. I'm looking forward to doing some photography soon, will share the best results. cookjaiii - I look forward to sharing better details in comparison to my Tasco, but I can say: Jupiter and Saturn will be my key focus for the comparison. I don't think you saw the Horsehead nebula - perhaps Orion Nebula? OK, final post for the night, here is the current setup - seems to do everything I need. 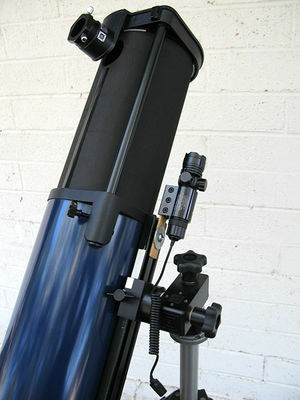 CG-4 mount, AWB reflector with 160mm tube rings to mount the Orion ST80. It's HEAVY! but very stable, at least compared to my alt-az. I don't regret buying the alt-az, it's great for throwing into the car and traveling, but this is starting to look like a legit setup. So the coma is due to the lens not being aligned with the reflected image. It is inherent in newts, but I'm thinking that the torque of the camera from the zoom eyepiece/barlow moment arm is torquing the focuser, and increasing the coma effect... thoughts? will something as simple as a bungie coord fix this? or should I think about reinforcing the focuser? Any commentary is welcome! Seriously cool setup though would love to try this as I get deeper into the hobby. To my surprise, my Onesky arrived yesterday! I wasn't expecting it for another week as I'm in South Carolina, pretty far away from Celestron in California. My wife and I were waiting anxiously for an email from AWB to say it had shipped since we ordered on Sunday, but we never got that email... until after I collimated the scope. So I got it collimated as soon as it arrived, seemed easy enough but maybe I'm missing some subtleties to the process. So I had to put it away and go to work. But my wife and I got it out last night once I got home just before the moon rose. Just set up on a table in my driveway. Even with all of the streetlights and porch lights that were on, we were still able to see M42!!! That was the first time I had ever seen anything like that. The contrast wasn't the best because of the light around us, but we moved over from that to M45. It's incredible how many stars just appear out of nowhere, beautiful. Popped over to observe Sirius and see it's brilliance through the scope. Incredibly bright! After that I moved over to see Mizar and Alcor, showed some neighbors as they walked by with their dog as well, so that was kind of cool. Later I went out to find M44 by hopping from Castor and Pollux and managed to find it. Fun playing connect the dots with that one. And then naturally, the moon! It was rising up over my neighbors house so I had some serious shimmer, but it was still really fun to observe this things from the driveway. Next time (most likely tonight) I'm going to put a shade up near the streetlight to put my driveway in shadow. Fun first night with the scope, and I'm hooked! Thankful for this thread and everyones contributions to it. I'm going to be building that light shield very very soon. Edited by Nathan.M, 24 March 2019 - 06:37 AM. Back in January (Post 3353, p. 135) I posted photos of a way to attach a green laser gun sight to the OneSky's mounting rail. Here's one of those photos again. That arrangement should work fine for anyone who can leave the laser attached when the scope isn't in use, but it isn't so good if you have to remove it regularly for storage or travel. The next photo shows an alternative better suited to that situation. Here's a close-up of the point of attachment to the mounting rail. The channel fits snugly over the central ridge on the rail, so that when you remove and replace it the alignment of the laser is preserved. The channel is secured to the rail with a captive knob that can be tightened without a tool and without fear of losing it in the dark. The last photo shows the laser detached. The bracket that comes with the laser firmly grips the sides of the aluminum channel. Strips of adhesive velcro on the channel and on the underside of the laser bracket are a fail-safe feature, just in case vibrations and changing temperatures might loosen the connection. 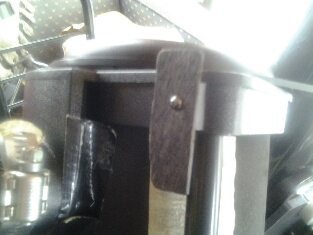 Notice the notch to clear the head of one of the two machine screws at the upper end of the OneSky's mounting rail. Hope this will be useful to someone out there. Aluminum channel should work for mounting other kinds of accessories to the OneSky's rail. It would be great to see variations posted in this forum. Edited by Lazaroff, 25 March 2019 - 11:14 AM. It would be great to see variations posted in this forum. This is my variation "of a way to attach a green laser gun sight to the OneSky". Piece of painted plywood, commercial double sided tape. Done. Just received my 1st ever telescope a few days ago, which is the AWB Onesky. I took it out last night briefly, as it's super cold here in upper Michigan, and even with gloves on my hands began to sting after about 15 - 20 minutes of unguided viewing. Just wanted to get the scope out and look at the sky! After my hands couldn't take anymore of the cold, I packed it down, placed the dust cover on, and brought it back inside. I then noticed a decent layer of condensation forming over the outside of the scope, and didn't remove the dust cap as I didn't want moisture to get inside. I imagine moisture would probably form inside regardless, and wonder if I should just leave the dust cap off next time so that any moisture inside is able to evaporate right away? Hoping someone could shed some light on this, as I'm completely new to telescopes and don't want to mess anything up. Thanks, and clear skies!